With many states in dire need of revenue, unclaimed property audits are on the rise. Under most states’ unclaimed property laws, a business must remit certain types of property to the state for safekeeping after the business is unable to contact the property’s owner for a specified period. Additionally, in order to ensure compliance, the laws grant the state the authority to audit businesses, regardless of whether the business has a presence in the state. If an audit exposes unreported unclaimed property, penalties, interest, and the cost of the audit may be imposed against the business. With these audits on the rise, businesses should review its procedures and be proactive in reporting unclaimed property. Generally speaking, unclaimed property is property that is owed to a person, but has not been paid because the owner cannot be contacted. Common examples of unclaimed property are accounts payable, unused rebates, unclaimed insurance proceeds, unused balances on gift certificates or gift cards, and uncashed payroll, benefit, or dividend checks. While most states’ laws are based on a uniform law, each state’s law may vary as to the types of property that is subject to remittance, the dormancy period for each type of property, and the reporting rules. Additionally, a business may be subject to several states’ laws as a business generally may be audited in any state. In order to make reporting easier, rules have been established that determine which state a business must report unclaimed property to. Typically, an audit begins when the state sends an initial document request to a business. Audits are usually conducted by third-party auditors that are typically paid on a contingency fee basis, which creates an incentive for the auditors to uncover as much unclaimed property as possible. Audits can be extremely time-consuming and may last for a period of several months. If an audit discloses reportable unclaimed property, the state will issue a liability assessment, which may impose penalties, interest, and the cost of the audit against the business. In Iowa, Iowa Code Chapter 556 regulates the disposition of unclaimed property, and the Treasurer of the State of Iowa handles all unclaimed property matters. Under Iowa’s law, businesses with unclaimed property must send written notice to the owners and must turn the property over to the state after a designated time period. The time period varies depending on the type of property unclaimed, but is usually three years after the property becomes payable. Additionally, businesses with unclaimed property must file an annual report of all unclaimed property with the Treasurer of the State of Iowa. Further, if your business receives an audit notice or is concerned about unclaimed property exposure, an experienced unclaimed property attorney and consultants should be engaged. These professionals can assist in protecting information gathered in connection with the audit and can also assist in identifying defenses. Lastly, this posting is intended to provide a broad overview of unclaimed property laws and is by no means comprehensive. 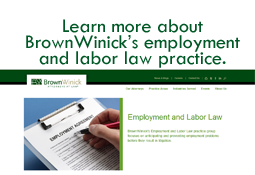 In order to obtain guidance on how the unclaimed property laws are applicable to your business, you should contact your BrownWinick employment attorney.